Mental illnesses are very common. Statistics say 1 in 5 adults in America suffer from mental health concerns. Some mental illnesses are mild. Depression and anxiety probably fall between the most common mental health concerns. Some may have more significant battles. There are dozens of other mental health diseases and disorders. My articles exist to help you, the reader, use your planners and bullet journals to improve your life. And if you struggle with your mental health, you also need to know that you’re not alone. Why? This post is here as I have a mental illness. 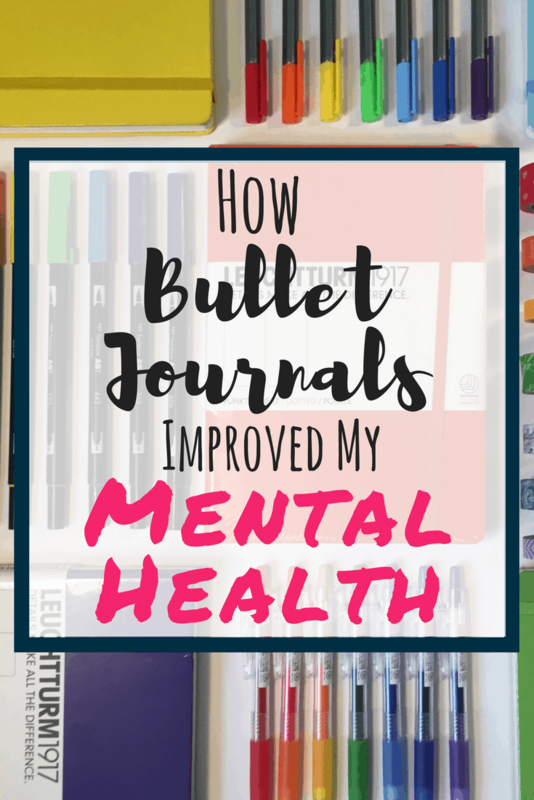 I want to share how bullet journals improved my mental health. If you have a mental illness, I hope you are able to use this information to help improve your situation. I have anxiety and depression. I received my first diagnosis of anxiety when I was 11. In college, I developed depression. Since then, my battles with mental health have come and gone. Currently (in September 2017), I’m just on the tail end of a battle that originally stemmed from postpartum depression back in 2015. I worry constantly about my ability to handle situations. It’s hard going out in public without feeling like everybody is talking about me behind my back. Sometimes I don’t feel like doing anything. Nothing feels enjoyable. My schedule gets chaotic; I stay up late, I start missing work, and I cry randomly. When I had my last recurrence, I went back to therapy to learn better coping mechanisms. I made very slow progress. Sometimes it felt like I took one step forward and three steps back. Even my own therapist knew I was at a stall. So, she decided to try something different. My therapist introduced bullet journals in October of 2016. Everything she told me was so intriguing, I jumped right in. I quickly fell down the rabbit hole of developing monthly and weekly spreads. I created many trackers. There were no bounds; I wanted to try anything to see a benefit. While I chose to pursue using my bullet journal for personal endeavors beyond therapy assignments and mental health workbooks, it didn’t take long to notice an improvement in my mental health. Over the course of about six months, I acquired many beneficial tools that eventually brought me to remission. But, I don’t want you to have to take that long to start seeing positive benefits! The bullet journal has been one of the most powerful tools in my bullet journal recovery. A beautiful weekly spread example from wezz.bujo on Instagram. This post exists you deserve to have these tips, ideas, and suggestions to improve your mental health. You may find similar benefits that I experienced, or you may find completely different ones! The neat part about bullet journals is that mileage does vary. The reasons I mention in this article are benefits that people can find some identity with. One of the first things I implemented in my bullet journal was behavior trackers. I thought of literally any behavior I struggled with in the past during challenging times and stuck it in that tracker. Examples I tried in trackers included: taking a shower, taking medications, and fruit/vegetable consumption. By monitoring these behaviors daily, it doesn’t take very long to see if there are any significant deficits occurring in certain parts of your daily living. Behavior isn’t the only thing you can track. Other examples you can track relating to your mental health include mood, sleep, and fitness. When you have data about your daily living, you can use it to make improvements down the road. If you use a mental health workbook with your therapist or on your own, it’s a great place to log your homework. One, your bullet journal looks harmless. It’s a notebook. But you can copy over the charts and instructions (you could even use a copier, print, and paste them if you want! Less work.). It’s almost easier to do the assignments in your bullet journal because it’s something you carry with you frequently. Plus, I honestly don’t like to carry my workbook with me everywhere I go. While I’m not ashamed of my mental illness, I don’t want every person in the coffee shop to know I have anxiety. If you choose to use your workbook solely for your assignments, you can still log and track details in your bullet journal that you need to put in your workbook later. And if your workbook recommends implementing a new skill, it’s easy to put reminders in your bullet journal. If you want, you can even schedule when you’re going to try out the new skill! Plenty of room to write down EVERYTHING! “So, how was your week?” Is likely the first thing to come out of a therapist’s mouth in a session. If you are anything like me, I struggle to remember what I ate yesterday for breakfast. I cringed knowing that each session I likely forgot something critical that my therapist should know about. Bullet journals fixed this SIGNIFICANTLY. My weekly spreads feature significant amounts of room to write about each day. When challenges arose (which they did! ), I had space to write them down. Once I started my bullet journal, each week I brought it with to my sessions. The first thing I’d do is open it up and scan for problems from the prior week. Let’s just say my progression no longer stalled once bullet journals came into the picture. My personal vendetta against a lot of workbooks and structured planners is that when something changes, you may find that those systems aren’t as beneficial anymore. But one of the BEST parts about the bullet journal system is that you can change it to fit your specific needs. For example, I probably floated between three different mental health workbooks during my time in therapy. Not every chapter of every book was necessary for me. By using my bullet journal to track which books I read and which assignments I needed to focus on, I was able to have a customized care plan tailored specifically to my needs. No more pounding my head against workbook chapters that weren’t relevant to my recovery. Change is constant, but the bullet journal system allows you to adjust and flow with the change. If something doesn’t work anymore, create something new that does. A gorgeous mandala drawn by Aimée on Instagram. Creativity is my muse. If I don’t have a place to doodle or express myself, I start to struggle. My bullet journals may appear over the top, but it’s relaxing. I find a lot of joy in doodling. It helps quiet my mind, which tends to be what gets me most in trouble with mental health (who else is a chronic over-thinker?). And even if you don’t find enjoyment in the artistic aspect, there are other ways to be creative with your bullet journal. As I mentioned above, you have the opportunity to customize your bullet journal in any way you want. You may find significant joy in creating your own versions of spreads and trackers. You may find inspiration, creativity, and ideas from others who bullet journal. “Get Through Each Day”- Sometimes just doing that is enough! Beautiful quote from dibersbrain on Instagram! Maintaining a bullet journal still takes work. If you don’t do the work, you will likely not see the same benefits I experienced. This post in no way, shape, or form implies that your bullet journal will make you recover from your mental health disorders. Improve doesn’t mean ‘fix’. 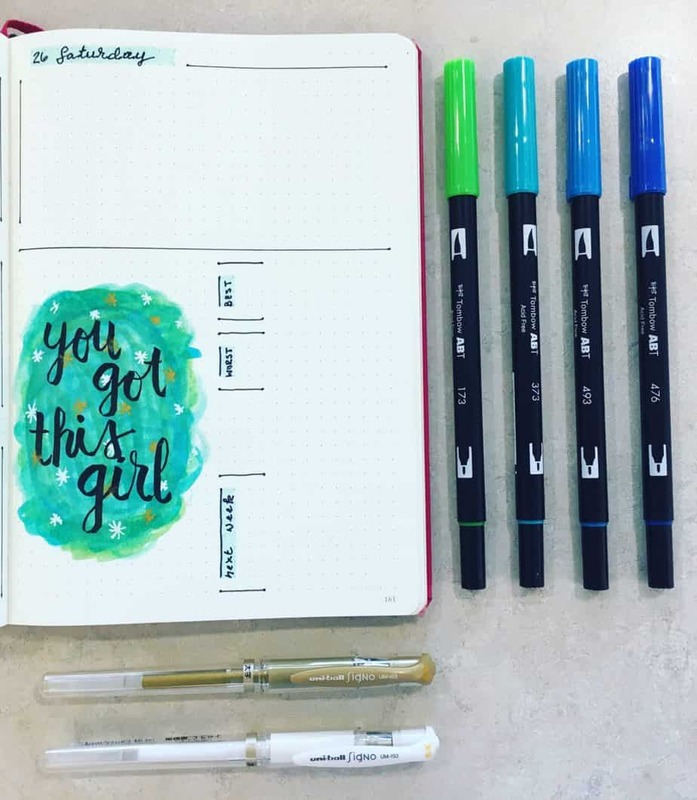 This post is focused on YOU using your bullet journal to aid with your mental health recovery. It is ultimately up to YOU to determine the amount of work you are willing to put into your bullet journal. I’d like to add a few parting resources that I found useful in the process of recovery. If you struggle doing things that you don’t feel like doing, I’d highly recommend utilizing this book. Called “The Happiness Trap“, this book written by Russ Harris provides excellent examples and sheds some serious truths on some topics related to your happiness and well-being. There’s even an illustrated version of this book that I adore!!! Also, remember to keep it simple! If you over-complicate your bullet journal, it’s much harder to keep up. 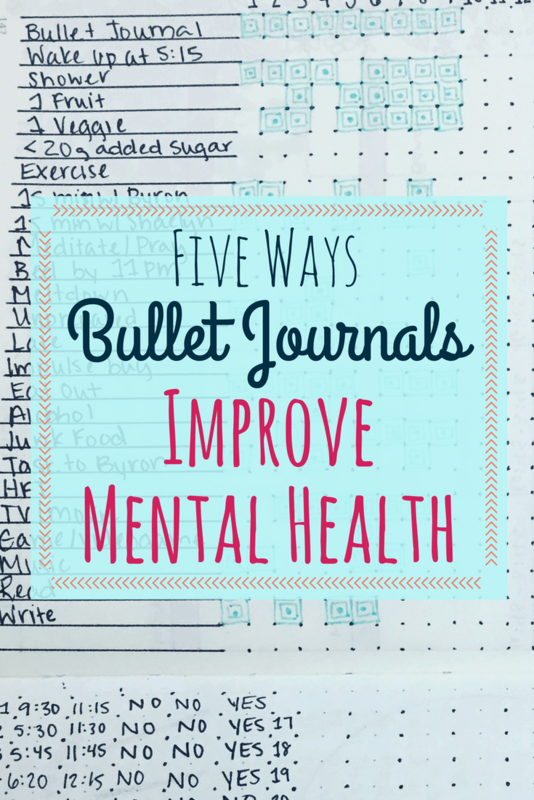 Have you found using a bullet journal helps with your mental health? Have you experienced different benefits in your daily living? I’d love to hear about your journey in the comments! If you feel it’s too personal to discuss in the comment section, but still want to reach out, that’s fine! Feel free to head to my Contact Me page and drop me a message! All information shared with me will stay safe and confidential. Did you enjoy reading this article? Or do you know somebody that may benefit from this article? Please share this article on Pinterest! (Despite your best efforts, if you continue to have mental health challenges and currently not seeing a therapist or psychiatrist, please consider setting up an appointment with your primary medical provider to see how they can assist you with care. If you are having suicidal thoughts, please call 911 or contact this helpline for additional assistance. From somebody who has struggled on this journey, you are not alone. I am just starting to read about bullet journals but have had issues with depression, bipolar, and ADHD for years. Various journaling methods have been suggested over the years but they all seemed overwhelmingly complex or refused to play nicely together. This finally sounds workable, if I can find a book and get myself to keep it with me! I thought I could do it in my phone but that doesn’t appear to register in my mind the same way. Thanks! It’s so much easier when it’s relaxed… and the power of knowing your habits and tendencies is so helpful. I wish you the best, and please reach out if you have any questions! I never thought of using my bullet journal to help track problem days… I have anxiety and depression and some days even with medicine I spiral but can’t always identify a trigger. There’s this other blog that goes more in depth on how to start bullet journaling. It’s especially helpful if you get anxious and easily overwhelmed with new things. I will probably write with a different colored pen to more easily identify days I am struggling..
Hi, Alicia! I hope you can find a system that works well! A mood tracker has been great, along with a habit tracker. Both help me determine if there are patterns in behaviors with certain moods. I hope it works out. Thanks for sharing the blog post, Alicia! It sounds like we share similar struggles and I found your post very inspirational and helpful, thank you. It sounds like you have a great therapist too (therapy and a good therapist is key to recovery I think), I would love to find one who would help me implement a bujo in my recovery. Any suggestions for how to find a good therapist who uses creativity and workbooks as part of their therapy? I don’t even know where to start looking. It’s been a long time since I’ve been in therapy and I really need the extra support but don’t know where to look. Thanks! It’s definitely nice knowing that you aren’t alone!!! As for the therapy, it was a long process finding people that I enjoyed connecting with. It took a year to connect with the therapist I had who introduced me to everything, and now I’m at the point where I no longer see her. You could always set up an appointment with your primary provider and see if they have any recommendations for clinics around town. Wish I had a better answer, but I do absolutely wish you can find a person who connects with you on that level!! I want to say the following. There are many things to do to feel better, I just want to include what I have been doing. How being creative helped me with my mental health by feeling good about myself by feeing more confident as I got better at these creative activities. Any activity you like doing can make you feel better about yourself . All of these activities can be used to distract a person from any sort of bothersome thinking. If you are having suicidal thinking, you should call 911. As we do a creative activity our minds shift from unwanted thinking to creative thinking. The more we like and focus on an activity, the more we get absorbed in the activity. To become engaged in any activity will take our minds temporarily off our negative thoughts. With my art, I did it all the time and drawing became a positive habit. All these creative activities can bring the user an increase in well being. They will also see that all creative activities can make you feel good. The process of doing an activity is what you should be focused on, not just the results. I believe their is nothing like seeing your finished product. I find doing a creative activity is relaxing. It makes me think, and plan. Eventually I will see the finished product. Any of the above activities is my go to thing to do when I’m bored, want to express myself creatively, get into a better mood, teach another people how they can use creativity to feel good. Bullet Journaling has done wonders for not only my mental health but also my physical health. I would track my ‘Up’ days and my ‘Down’ days and my therapist would look at how I was tracking at my appointments. This information would then be utilised in regards to my medication for Depression and Anxiety. We also determined the pattern behind my migraines (2 years without migraines now!) and several other health issues that had been plaguing me. It’s amazing how, sometimes, you don’t think there’s a problem until you’re looking at it written out on paper. 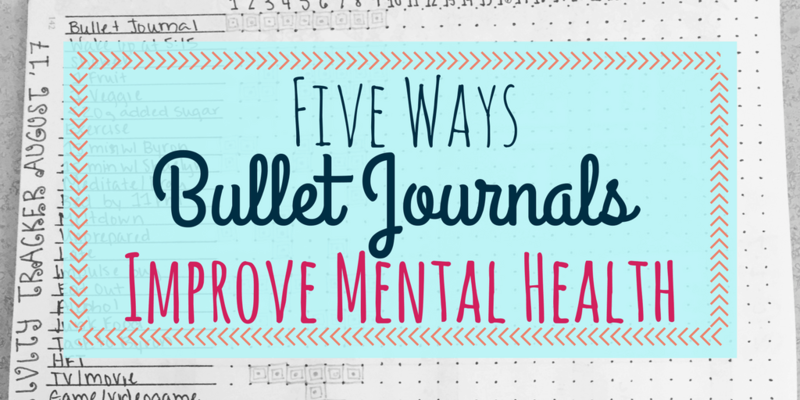 It also helps relieve the anxiety in knowing that if a new pattern starts, the Bullet Journal will pick it up! Hi Rachel, I have anxiety and depression as well. I just started a bullet journal, and I have been searching for the right technique and therapist for several years. If you would be willing, I would love it if you would tell me what workbooks you have been working in. I realize that each person is different, and has different needs, but I would love a place to start, and I will take them to my therapist. Thanks for this post in any case. I have struggled with depression and anxiety for years. I have bipolar disorder also. About three months ago I started bullet journaling. At first it was a little hard but after awhile I started to get the hang of it. Now I really enjoy it and do use it to track my moods, my medications,etc. Now when I see my doctor I have a record of everything. She thinks it’s such a great idea and is recommending it to others. I also love looking at all the ideas you share. I love reading your e-mails because they are very informative, love the spreads too. Thank you so much! I also live with anxiety with intermittent depression. I have been bullet journaling for 2 years now, and those 2 years have also been the most critical and taxing period in my life as I fought to maintain and display emotional and psychological stability in order to regain custody of my son. I used my BJ to track my moods, responsibilities, visitations and undertakings and I honestly don’t think I could have been successful otherwise. At the time I kind of felt as though I were ‘ticking boxes’ as a means to the end, but the evolution of my psyche throughout the process is undeniable – especially when flicking back through my old journals. I’m not usually one to comment or interact online, but your post made my eyes a little moist and I felt compelled to share the attachment and gratitude I feel towards my bj that will make little sense to the vast majority. I have major depressive disorder, generalized anxiety disorder, and developmental trauma caused by childhood emotional neglect. I struggle with staying focussed ans organized. My memory is shot. I decided to try a practice month in my normal planner (to see if I would stay with it)- I did med tracking and water tracking. I rarely drink water but with the new tracking system I have been having 6-8+ glasses a day. I often forgot to take my meds and dr recommended vitamins (I take 9 pills/vitamins a day), sometimes for a whole week. By tracking my meds in my planner I have been really good at taking all my meds, every day. I only have a few times I’ve missed – and those were nights I decided last minute to stay at the trailer and didn’t have my meds. I have now started designing my first bujo – can’t wait for Sept 1 so I can start using it!! I’m adding a mood tracker and a daily accomplishments section (on advice of my psychologist). I have an autism diagnosis and without my journal my life simply don’t work. I’ve kept a journal since I was a child. I didn’t know it was a thing or that it had a special name, or special notebooks and such. 🙂 Though the fancy journals do look pretty, you can use any notebook to keep a journal that allows you to keep track of stuff and plan your days.